Jerry Brown is an American politician. Jerry Brown was elected governor of California in 2010, an achievement made more remarkable by the fact that he had already been the state's governor in the 1970s. The son of former California attorney general and governor "Pat" Brown, Jerry Brown was a Jesuit seminary student and lawyer before he followed his dad's path into politics and government. Jerry Brown was California's secretary of state (1970-74), then succeeded Ronald Reagan as governor and served two terms (1975-83). A young bachelor with a quirky but media-friendly persona, Governor Brown made national news for his progressive politics, his presidential ambitions and his personal life. He lobbied for a communications satellite and was labeled "Governor Moonbeam"; he played the spoiler role in the Democratic presidential primaries of 1976 and 1980; he dated pop singer Linda Ronstadt and took her on a highly publicized trip to Africa. After his second term as governor he ran unsuccessfully for the U.S. Senate, traveled to Japan to study Zen Buddhism, worked in Mother Teresa's programs in India and hosted a California radio show. He also ran for U.S. President in 1976, 1980 and 1992. A maverick Democrat throughout most of his career, Brown was elected to the nonpartisan post of mayor of Oakland, California in 1998 and re-elected in 2002. He was elected to be the state's Attorney General in 2006, his reputation as a far-left liberal having been somewhat tempered from his early years. 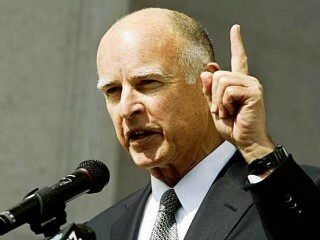 In 2010 Brown again won election as governor, beating Republican Meg Whitman, the former CEO of online auction site eBay. He took office for a four-year term in January of 2011. Jerry Brown married for the first time in 2005, to Anne Gust, a former lawyer and Chief Administrative Officer for clothing chain The Gap. Anne Gust Brown was born on 15 March 1958. View the full website biography of Jerry Brown.